When you start your business, you have several options for structuring it. Your choice will affect your income tax situation and your potential liability if something goes wrong. The default option and the simplest option is to be a sole proprietor. You won’t need to fill out any legal documents to determine how profit-sharing from business operations will be determined because all profits flow directly to you, the business owner, as personal income. One of the biggest advantages of a sole proprietorship is that you don’t have to consult anyone else (except maybe your family) before making a business decision. And you can still use a business name that is different from your personal name; you don’t have to incorporate to get that benefit. This structure is acceptable if you are the business’s sole owner and you don’t need to distinguish the business from yourself for tax or liability reasons. In a sole proprietorship, all profits, losses, assets and liabilities are the owner’s direct and sole responsibility, and you pay self-employment tax on your income. Sole proprietorships are not ideal for high-risk businesses because they put your personal assets at risk. If your business involves an activity for which you might potentially be sued, then you should choose a legal structure that will better protect your personal assets. Businesses that can put you at above-average risk of a lawsuit might involve child care, animal care, health care, engineering, manufacturing or selling edible goods, repairing items of value, and providing alcohol. These are just a few examples. There are many other activities that can make your business high-risk. Anything where the stakes are high in terms of injury, loss of life or loss of assets is not a good candidate for a sole proprietorship. An LLC is a limited liability company. This business structure protects the owner’s personal assets from financial liability and provides some protection against personal liability. There are situations where an LLC owner can still be held personally responsible. If you intentionally do something fraudulent, reckless or illegal, or if you fails to adequately separate the LLC’s activities from your personal activities, you can lose the protection an LLC offers. This structure is established under state law, so the rules governing LLCs vary depending on where your business is located. According to the IRS, most states do not allow banks, insurance companies or nonprofits to be LLCs. Because an LLC is a state structure, there are no special federal tax forms for LLCs. But an LLC must elect to be taxed as an individual, partnership or corporation, and you will need to file paperwork with the state if you want to become an LLC. The accompanying setup fees usually range from $100 to $800. In some states, there is an annual fee for being an LLC. Like the LLC, the corporate structure distinguishes the business entity from its owner and can reduce liability. However, it is considered more complicated to run a corporation because of tax, accounting, record keeping and paperwork requirements. Unless you want to have shareholders or your potential clients will only do business with a corporation, it may not be logical to establish your business as a corporation from the start — an LLC may be a better choice. There are two types of corporations: C corporations and S corporations. C corporations are considered separate taxpaying entities. They file their own income tax returns, and income earned remains in the corporation until it is paid as a salary or wages to the corporation’s officers and employees. Corporate income is often taxed at lower rates than personal income, so you can save money on taxes by leaving money in the corporation. If you’re only making enough to get by, however, this setup won’t help you because you’ll need to pay almost all of the corporation’s earnings to yourself. If the corporation has shareholders, corporate earnings become subject to double taxation in the sense that income earned by the corporation is taxed, and dividends distributed to shareholders are also taxed. However, double taxation is not a concern for new businesses; you’re unlikely to have shareholders or to pay dividends. RELATED: S Corp Vs. LLC: Which Should I Choose? A partnership is a structure you can use if you are not going to be the sole owner of your new business. In a general partnership, all partners are personally liable for business debts, any partner can be held totally responsible for the business and any partner can make decisions that affect the whole business. In a limited partnership, one partner is responsible for decision-making and can be held personally liable for business debts. The other partner(s) merely invests in the business. Although the general structure of limited partnerships can vary, each individual is liable only to the extent of their invested capital. LLPs are most commonly used by professionals such as doctors and lawyers. The LLP structure protects each partner’s personal assets and also protects each partner from debts or liabilities incurred by the other partners. LLP regulations vary by state. Partnerships must file information returns with the IRS, but they do not file separate income tax returns. For tax purposes, the partnership’s profits or losses pass through to its owners, so a partnership’s income is taxed at the individual level. LPs and LLPs are also state entities and must file paperwork and pay fees similar to those involved in establishing an LLC. If you’re operating alone and you’re not entering a high risk line of work, don’t have to choose a business structure right away; you can remain a sole proprietor and see if it makes sense to incorporate or become an LLC later. If your business will have more than one owner from the start, then it can’t be a sole proprietorship. In this case you will have to choose another structure before you start doing business. 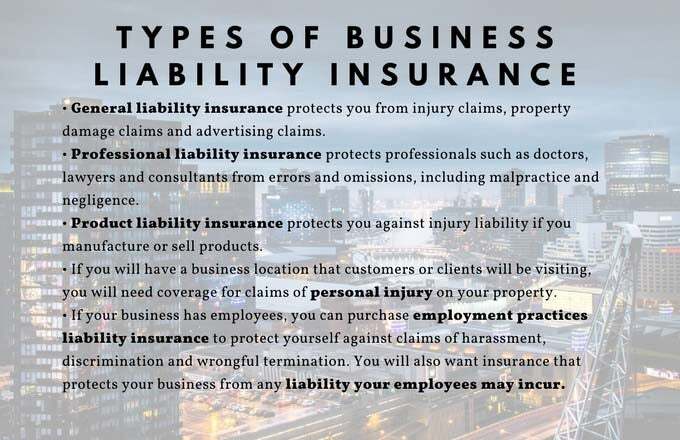 Regardless of your structure, business liability insurance is a good idea. You shouldn’t rely entirely on the legal structure of your business to protect you. Business insurance offers a second and often essential layer of protection. It shields you from legal fees and judgments if your business is sued. The graphic below shows some of the basic policies and their purposes. Next, we’ll discuss how to transition from your current job to self-employment. Find out what you can do when your company is sued and learn how to avoid a lawsuit and the actions to take to protect your company. Understand the tax implications of running a small business in California, and learn which state taxes apply based on business type. Learn the tax implications for small businesses in Texas, and discover how different types of small businesses, such as LLCs and S Corporations, are taxed. If you're a small business owner, note these potential tax deductibles so that you don't pay taxes that could have been extra revenue in your account. Learn why Florida's tax laws make it an attractive place to start a small business, and understand the types of taxes a small business owner must pay there. Small business owners should consider these year-end tax savings strategies. An LLC is a powerful tool for estate planning. By establishing a family LLC, parents can distribute assets to their children with significant tax savings. Limited liability partnerships (LLPs) are a flexible, legal and tax entity that allows partners to benefit from economies of scale while also reducing their liability. Business owners who implement these strategies throughout the year will find filing taxes less stressful. Unlimited liability means that the owners of a business are liable for the entire amount of debt and obligations of that business.